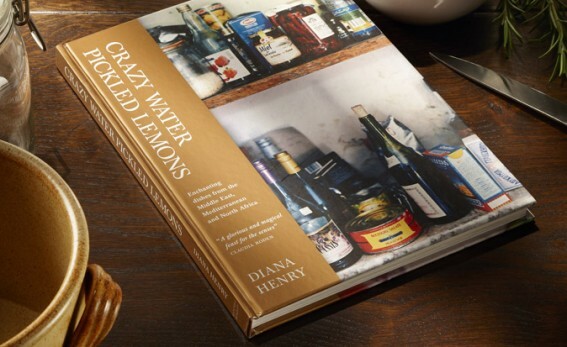 Diana Henry’s first book Crazy Water Pickled Lemons wowed critics, became an instant hit with foodies everywhere and has gone on to inspire a particular style of food publishing. The book is an exploration of magical dishes and exotic ingredients, from the lesser-explored areas of the Mediterranean, North Africa and the Middle East. Appearing in a new edition for 2012, Crazy Water Pickled Lemons is a classic that was shortlisted for the Glenfiddich Cookbook Award when it was first published. Infused with richness, Crazy Water Pickled Lemons provides a spectacular feast for the senses, as the foods are colourful, aromatic, perfumed and exotic: ingredients that can be enjoyed in our imaginations as well as our mouths and foods that allow us to experience faraway places whilst remaining where we are. All the recipes have an enchanting quality. There are foods whose poetry comes from their magical names or the stories behind them – such as Pearlfisher’s Rice, a honey sweetened rice from Bahrain to be eaten with lamb, so called because its high sugar content was thought to help pearl divers stay under water for longer. Or a dessert called Ice in Heaven, a Middle Eastern milk pudding of rose perfumed ground rice. Then there are dishes which seem quite ordinary but in their cooking have undergone such an amazing transformation – that it s hard to understand how they work. Consider Middle Eastern Orange Cake, made with pureed whole, cooked oranges, mixed with eggs, sugar and flour and baked to citrussy moistness. Crazy Water Pickled Lemon will bring an intoxicating whiff of the exotic to your table and pleasure to your kitchen. "Diana Henry offers a charmingly personal take on exotic foods and dishes which have a touch of magic. Her passion is infectious and her recipes tantalizing." "A glorious and magical feast for the senses."